President Obama has visited Saudi Arabia more often than any of his predecessors, but his fourth trip to the kingdom on Wednesday seemed less a sign of the strength of the relationship than of its fraught nature. Obama met first with Saudi King Salman, and on Thursday he took part in a regional meeting with the United States’ Arab allies in the Persian Gulf. But the backdrop to the visit is a broad recognition that the U.S.-Saudi alliance, long built around oil and security, appears to be in flux and that neither side seems certain what they want out of it. Republican Senator Lindsey Graham this week proposed a new compromise for the bill, which would require a higher burden of proof necessary to sue a foreign power, such as Saudi Arabia, and “make it far more difficult to hold nations responsible for terrorist acts carried out by proxy forces,” John Hudson wrote for Foreign Policy. The Obama administration said (before Mr. Graham’s proposal) the bill could lead other countries to enact laws that could strip US citizens of sovereign immunity in foreign courts. The controversial legislation wasn’t a subject of the two-hour discussion between Obama and the king, which aides described as the longest meeting Obama has had with the Saudi monarch. Instead, the two talked more broadly about the friction in the relationship on issues such as the president’s outreach to Iran and the Saudi insistence that the United States should act to remove Syrian President Bashar al-Assad from power, administration officials said. Obama, meanwhile, urged the Saudis to seek some kind of accommodation with Iran that would help to defuse the sectarian strife and proxy wars that have led to humanitarian disasters and failed states in the Middle East. The unusually long meeting between the two leaders reflected a broad and shared uncertainty about where an alliance previously built around Saudi oil and American arms is headed. For Obama, the visit is part of an ongoing effort to set the relationship with the Saudis on more solid ground and emphasize the two nations’ common interests. The Obama administration has sold the Saudis more than $95 billion in military hardware over the past several years, and Saudi intelligence has been essential to the counterterrorism fight against al-Qaeda and the Islamic State, officials said. Obama said in an interview with CBS News this week that he expects that Iraqi forces, backed by American advisers and air power, will push the Islamic State out of Mosul, the largest city in northern Iraq, by the end of the year. Obama insisted to the Saudis, who have bristled at his public criticisms of the kingdom, that his repeat visits were evidence of the importance he placed on the U.S.-Saudi relationship. Both sides, though, seem to want to move forward on different terms. Obama has said he wants the Saudis and the gulf allies to play a greater role in maintaining their own security and the security of the region. The Saudis have suggested publicly that they have become too dependent on American firepower, and both King Salman and his son, Defense Minister Mohammed bin Salman, 30, have vowed to take a bolder approach to the region. The problem has been one of execution. The Saudi air campaign in neighboring Yemen has led to hundreds of civilian casualties, shifted attention from the fight against the local al-Qaeda affiliate and failed to dislodge rebels from the capital, Sanaa. Saudi Arabia and its allies seek to restore the government ousted in early 2015 by the Houthi rebel fighters, who Saudi leaders say are backed by Iran. The execution of dozens of terrorism suspects, including a leading Shiite cleric earlier this year, has further inflamed sectarian tensions at a moment when the region can ill afford it. 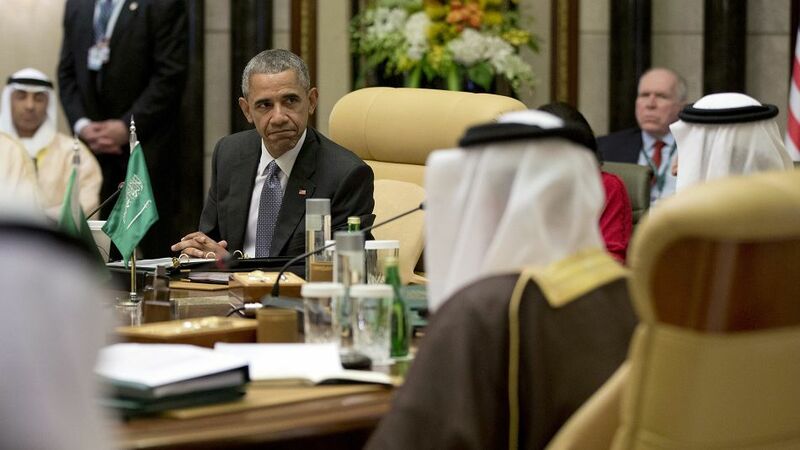 Aides said that Obama and the king had a longer-than-anticipated discussion on Saudi Arabia’s human rights record. The disagreement between the two nations extends to Obama’s historic accord with Iran to curb its nuclear program, which the president has said will keep Iran from obtaining a nuclear weapon and prevent another American war in the Middle East. On Tuesday, the US and the Gulf Cooperation Council agreed to conduct joint maritime patrols to prevent Iranian weapons smuggling. Additionally, a general agreement was struck to cooperate in order to improve Gulf missile defence, special forces and maritime security. “We would argue that the removal of the threat of a nuclear-armed Iran is good for the United States and the [gulf allies],” Rhodes said. In Saudi Arabia, the deal is considered part of a broader American pivot toward Iran — a point of view that even billions more in American arms sales, designed to protect Saudi Arabia from Iran, will not completely erase. As the Saudis are looking at what lies ahead in the post-Obama era, uncertainties abound. The main republican contenders, Donald Trump and Ted Cruz, have both issued statements critical of Saudi Arabia and GCC leaders have called Mr. Trump’s rhetoric “hostile, racist and inhumane”. But Mr. Trump has also opposed the Iran nuclear deal and said the US should have backed former Egyptian President Hosni Mubarak, Gulf analyst Mr. Cafiero pointed out. “GCC leaders view Hillary Clinton, whom they have worked with for many years, as a relatively steady and predictable presidential candidate,” he told The World Weekly. Democratic contender Bernie Sanders, in contrast, is a rather unknown figure to Gulf leaders.